Dream Catchers are one of the most fascinating piece of art crafted by Native Americans. The traditional dream catcher was intended to give an individual, especially infants and kids, a peaceful sleep with only good dreams. The circular ring reflects the shape of the rising sun while the feathers evoke the breath of life. 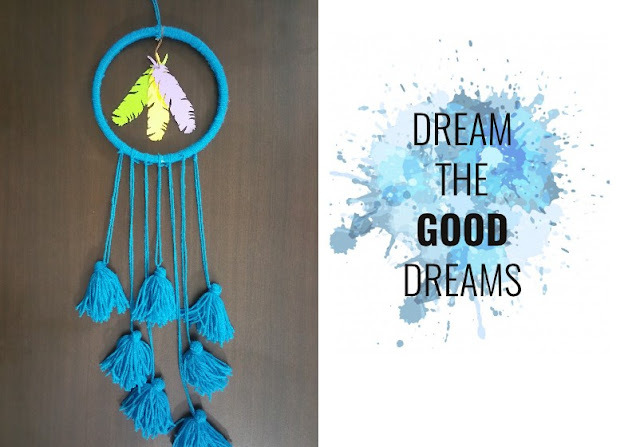 This colorful and trendy dream catcher with tassels make the perfect statement piece and could also serve as a beautiful accent for your home. Great as a gift and a beautiful activity to keep anyone engaged during parties or holidays. This DIY Kit is hand assembled in our studio using 6 inch wooden ring, bright color yarns and paper feathers. Each kit comes with detail instructions so it is a breeze to create your own stylish wall hanging. If you want to make your own dream catcher but do not wish to go out and buy all the materials then this is for you. Everything you see in the photo is included in the kit. Getting creative is now more fun and better for your soul!! !